The Texas Stars had two roster moves today with one joining the roster and another leaving. The big news is that reigning AHL MVP Travis Morin has returned from his time in Dallas. This comes just one game shy of him losing his waiver exemption. In a move more closely related to the return of Julius Honka, defenseman Connor Hardowa was also released from his professional tryout. 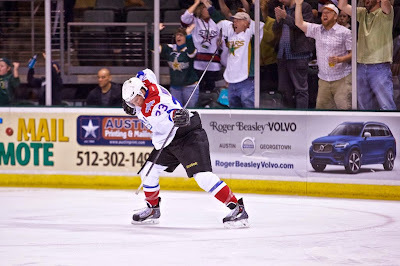 The Texas Stars, American Hockey League affiliate of the NHL’s Dallas Stars, announced today forward Travis Morin has been reassigned to the team from the NHL and defenseman Connor Hardowa has been released from his Professional Tryout Agreement. Morin, 29, appeared in five games for Dallas during his most recent NHL call up, tallying one assist. The 6-foot-1, 190-pound native of Brooklyn Park, Minn. was leading Texas in goals (10), assists (14), and points (24) before he was called up. Morin is the reigning AHL Most Valuable Player after tallying 88 points last year. Morin was a ninth-round pick (263rd overall) of the Washington Capitals in 2004. Hardowa, 26, appeared in five games this season for the Stars. The 6-foot-1, 210-pound defenseman appeared in 19 games this season for the ECHL’s Utah Grizzlies before signing a tryout agreement with the Stars. Well, shoot! They could at least trade him if they're not going to put him on waivers. He would be an asset to at least a half dozen NHL teams! "The big news is that reigning AHL MVP Travis Morin has returned from his time in Dallas. This comes just one game shy of him losing his waiver exemption." For us newer fans, what does this mean in practical terms? Good question. If you go check out the glossary section of this site (linked at the top), there is a description of waivers. Travis Morin was assigned one game short of needing to go through waivers to be assigned. Reply back if anything is unclear after reading the glossary entry. Hey Stephen, just following up on Morin's waiver-exemption, do you know if this is why he was exempt? Short version- is he now one game short of ten NHL games since last clearing waivers? In your glossary entry on waivers, it states "If a player has already cleared waivers once in a season, he must clear waivers in order to be assigned if he has played ten or more NHL games since the last time he cleared waivers." The NHL CBA (section 13.2b) basically says the same thing: "a player may be loaned to a club of another league, upon fulfillment of the following conditions:...the player has not played in ten or more NHL games since regular waivers on him were last cleared"
Morin has played in nine NHL games since the start of the 2013-14 season (4 last season, 5 this season), so is the fact that he is one NHL game short, make him waiver-exempt? Did he clear waivers sometime early last year? Just trying to understand the process a little better. Whatever the case may be, I'm very glad he is staying in the Dallas/Texas system! Go Stars! You're right though. Nine games since last clearing, which he had to do at the start of last season. The new CBA got rid of the rules that made it so each player had to clear waivers *again* at the beginning of every year. If you want to add to confusion, there's also a ticking clock in terms of days regardless of if you play or not. I believe he had 7 days of cushion on that one. Got it. Thanks bud, appreciate the response! No problem. Waivers are super confusing even for veterans. It's usually a group effort in the media to make sure everything is right. Ok, dumb question follow-up: What would/could have happened had he had to "go through waivers"? When a player is placed on waivers, they are usually destined for assignment in a lower league. When this happens, the player is on waivers for a 24-hour period, which ends at 11 AM CST on the day after the player is placed on waivers. During this time, any other NHL team has the right to place a waiver claim on the player. By submitting a waiver claim, the NHL team is saying that they would like to bring the player into their organization and use them in the NHL. If the player is claimed, he must be on that team's NHL roster for at least 30 days following the claim. If the new teams intends on sending the player down to the minors after that 30 day period, he must again be placed on waivers and pass through in order to be assigned. If, after the 24 hour period, no team has claimed the player, he is said to have 'cleared' waivers and can be assigned to the AHL. Some players are placed on waivers and then not assigned.